We returned from our holiday trip last week. I had cleaned out the fridge before going on a week long vacation. The only available things were a couple of tomatoes and eggs. 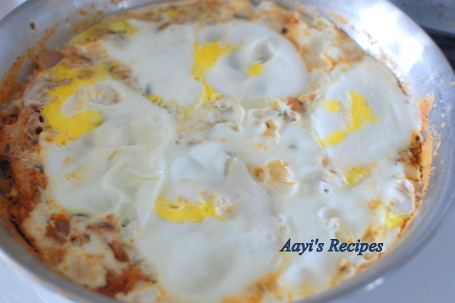 We were craving for something spicy and I made this dish similar to egg patia. Some 4 years ago, few of our friends had invited us for dinner and they had served something similar. So both these recipes were inspirations for this. 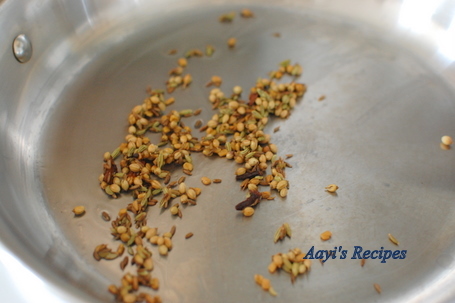 I served this with rice and a simple dal. 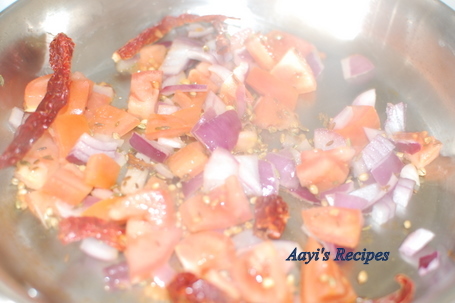 In a flat bottomed pan, heat oil and fry all spices. 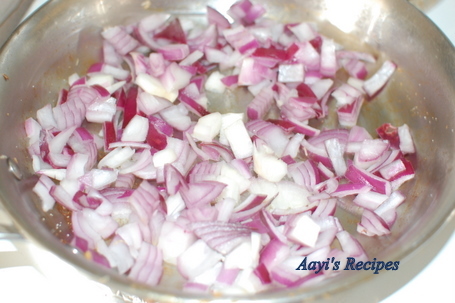 Then add 1/4 cup onion and fry for few minutes. 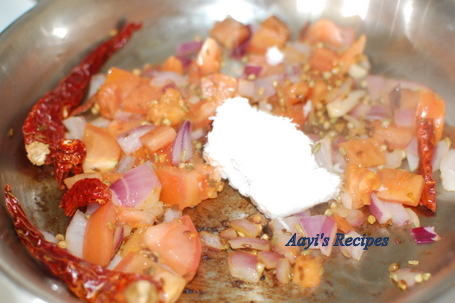 Add tomato, coconut, salt. Fry till tomatoes are soft. Grind to a paste (do not add too much water. Make it chutney consistency). 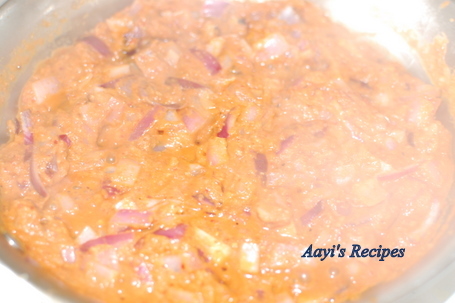 In the same pan, heat some more oil and fry remaining onion. Add the paste and spread it evenly in the pan. 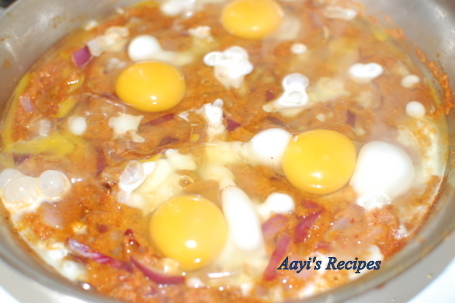 Add the eggs on top. Sprinkle little salt (masala already has salt, here only the eggs needs little more salt). Slightly poke the egg yolks. Cover and cook till the eggs set. Cut it into pieces and serve hot. PS: If you cook the eggs too long, they become rubbery. So take it off the heat once they set. wow…That looks absolutely yum…:)Happy new year to you!! What a quickie and so delicious. I love all the flavor combinations in this recipe. Thanks for posting! wish you a very happy new year 2011.
i will to do this. Thank you for fixing the search engine! hi really nice i once had this in dubai hotel…. I make it, was taught by my husband. It tastes great with hot parathas. Makes a delicious healthy breakfast! i make this too.But instead of red chillies,i add green chillies,ginger,garlic.Tastes different..but good..
Oh my, this looks delicious! I’ll give it a try this weekend. 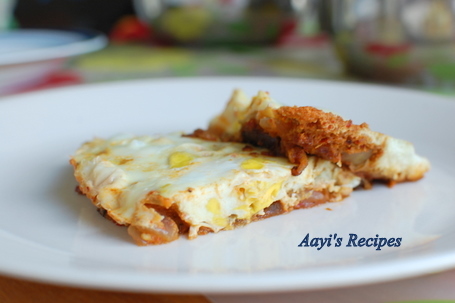 That Egg Recipe I like and I can try today. I think this dish is called ‘Khaginaa’ and is best had with crusty bread….you have given a nice Konkani twist to it by adding coconut. Hi Shilpa,Tried it yesterday. Came out very well and everybody loved it. A different egg dish. Definetly a keeper. Thanks for sharing with us.